And I thought nothing could ruffle you, Jayne! Was so great to meet you up close and personal! Thanks for coming by and reading my 5. Thank you! Look forward to it! Wonderfully well written. Love it! Why thank you my dear friend! Oh my soulful, sweet one. Thank you for letting it touch you. Stunning and awe inspiring. Great Work! Hello, and thank you for visiting–welcome to The Jaded Lens! I’ll stop on over and see your offering as well! You and Jayne, together, blushing? Now that would be a sight! Oh oh oh oh. Now that’s intimacy. You nailed it chickadee! Aww … that was blushing with sweetness! The voice in this was compelling. Nicely and sensitively done. Sandra, I struggled with the voice, which surprised me. I guess our ability to manage and express passion is more difficult than it may seem…but then “Fifty Shades of Grey,” despite the purported poor writing, has managed to capture more than a few readers. Passion…a loaded subject. I appreciate your weekly visits! Oh wow! This was fabulous. Lovely work with the prompt. Thank you CC! I appreciate your visit. I have not made all my rounds yet! Gorgeously passionate, wonderful words Britton! 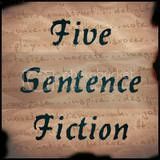 I always love your visits, Lisa, and I love how “five sentence fiction” writing can unlock that which is hidden. Delicious and oh so intense… nice one Britton! Thank you, Michelle. It was a indeed a delicious fantasy and I’m glad you liked it!